seems strange when I think about the leaves changing in mid-Sept., at the Top of Utah marathon in Logan, but mid to late Nov. is our typical, peak of fall color. This morning, I headed down with friends to run the Gulf Coast half marathon on the Stennis Space Center campus. Flat, fast, and cold, my kind of race ! I mean, feast on Thurs., and race on Sat. - seems smart to me. We were excited to be greeted with chilly race conditions. with the extra few lbs. of recent wks, I had low expectations, but always go into great weather races with HIGH hopes. Apparently the humidity was LOW because I felt really good today. Today's time is 51 seconds faster than my 2010 half marathon PR race, on this same course. 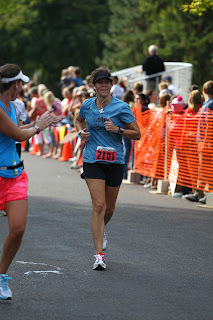 Typically, I don't run a lot of half marathons, but that will change this winter. It was a PR kind of day and several of our friends left the Gulf Coast with new personal records. I do enjoy running even splits. I saw a friend at the race who has dropped a few lbs., and looks SUPER - we discussed, and she inspired me ! ** 44 year old, NOT warming up before the half, especially on a cold weather day - classified under DUMB ! 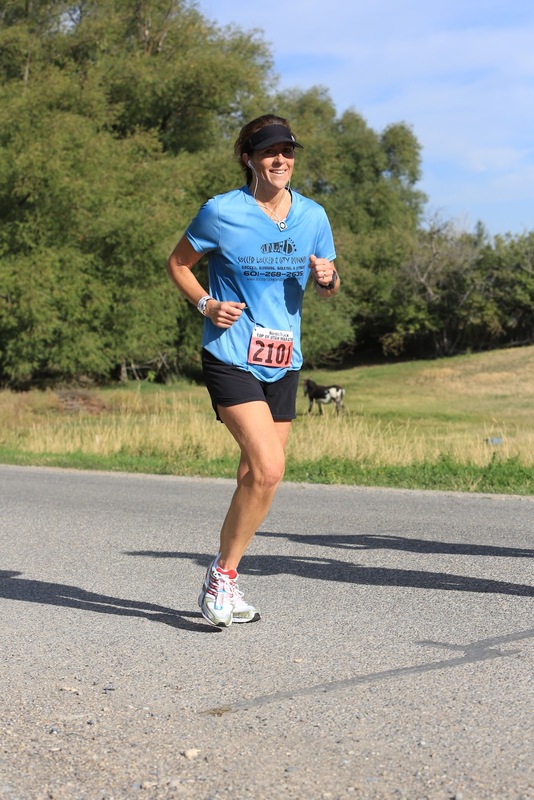 the extra lbs - yes I ran a PR with the extra weight, BUT what can I run a few lbs lighter ? - "room for improvement"
Thought I would do a quick bullet point update. arrived in the mail Monday! **As of today, I have 220 miles left to run to make my goal of running 2012 miles, in 2012. **I'm in the middle of a shoe crisis. I've been in Adidas Cushion Response 17, for several years. Prior to these shoes (when I was younger maybe ?? ), I bought any cushioned, "on-sale", running shoe and it worked. That changed, but the Adidas worked GREAT for many years. Then like all shoe companies, they changed the shoes - the newer model didn't work, so I bought up all of the CR17s that I could find online. Currently, I'm on my last few pairs (I rotate shoes). Recently, I've been trying some different options. Brooks & Mizuno - tried but didn't like. I've been using these for shorter mileage days for a while. No big issues, but no big comfort either. More recently, I bought some Nike Pegasus and Asics Nimbus. I introduced these while still rotating through my Adidas. 2 weeks ago, I developed what I think is shin splints, but only on the left shin. Leading up to the mild shin pain, I had most recently ran in the Nimbus. I immediately scaled back the intensity. I know, without a doubt that ice works very well for me. So I iced, iced, iced, heated prior to running, added some rest days and then the step-back week (last wk). In addition to being extra cautious, I also moved back into ALL ADIDAS running. The shin has gradually improved, and currently it's just a "faint feeling" from time to time. I would describe this as a nag. I'm VERY fortunate! I've been running for years, and this is my first mild case of shin splints. When the pain has completely faded away, I will try to add the Nike, or the Nimbus back into the rotation, but this time I will add one brand of shoe at a time, and I will do it even more gradual than before. At this point, I will say, that I'm slightly STRESSED. My fear is not being able to find a comfy shoe. Also, I'm stressed about this EXPENSIVE (for me) experiment. My hope is that I can add the new shoes more gradually, and maybe my spoiled "HappyFeet" can continue on their path of many years of HappyFeet running. **On Nov. 17th, I ran the Run for Life 5k in Houma, LA. Perfect conditions, flat and fast course and my time was 23:40 Official and Garmin time. Three weeks later and 45 seconds slower - ???. I'm afraid you read it correctly. What happened ? you know the deal - my weight is NOT stable - up and down, up and down. Nothing like a slow 5k to get me motivated to reduce my calorie intake, AGAIN. How can it be that I'm already up in lbs. BEFORE the holidays ! **This Sat. I will run the Stennis Half Marathon. This is a fun race and several runners from Hattiesburg always show up. This year I will be riding down with some local friends (Terri, Dawn, and John Mark). Should be a FUN day with friends. After the 5k, I have no big expectations with the extra lbs., but I will run a quality run and burn some calories. I have another half marathon in a couple of weeks. I'm hoping to drop the few extra lbs by then and be ready to race that one in Madison, MS on Dec. 8th (if the weather is right). I'm back at it ! 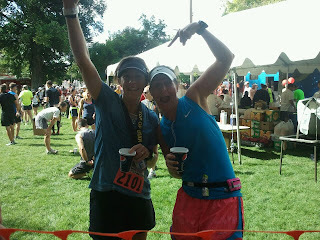 after the TOU marathon, I took 10 days off from running. During the downtime, I did some walking and biking and not much else in the "body movement" department. typical, my waste expands, leading me back to increased intensity. in addition to the circumference of my waste, I just like some intensity. I'm not good at "just running" day after day. what can I say, I bore easily. Oct 5th -Harvest Hustle - a 5 mile race as a "true" tempo run - 1st quality run, post TOU. at the 6PM start time it was a little warm, but the temp was dropping fast. the humidity wasn't bad, making it a great evening for a tempo run, and visit with local friends. this race also had a 5k, so that split the field of runners giving me an advantage. I ended up winning the race and winning a $30.00 gift card and I also scored a $25.00 restaurant gift certificate - nice! happy to be back at it. also pleased with a solid "come-back" tempo run, even splits, and the final mile being the best mile. Happy ME! 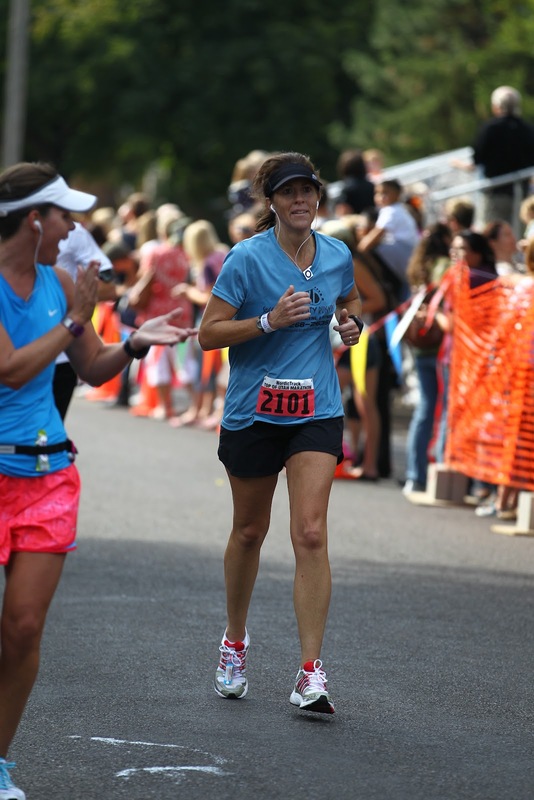 Oct 14th - I signed up for the Gulf Coast half Marathon - Mandeville, LA last year when they were offering a discount that "happyfeet26.2" just couldn't resist. Later, I decided on the TOU for my fall marathon, so the 13.1 mile race was NOT going to happen. However, a distance runner can always "use" some distance in their life - racing or not. I had a 3 AM alarm which I did not like. In addition, I did not like the thick air that rudely greeted me as I opened the door. 70ish degrees, and 90something % humidity is not fun. Not only is it not fun, humidity is just HARD on my body. My goal for the race was an 8:30 avg pace, training run++. I thought this was doable. I mean really, I ran a full at 8:31 avg pace, surely I can run a solid training, half marathon at full marathon pace? the answer was NO, and I'm totally fine with that. 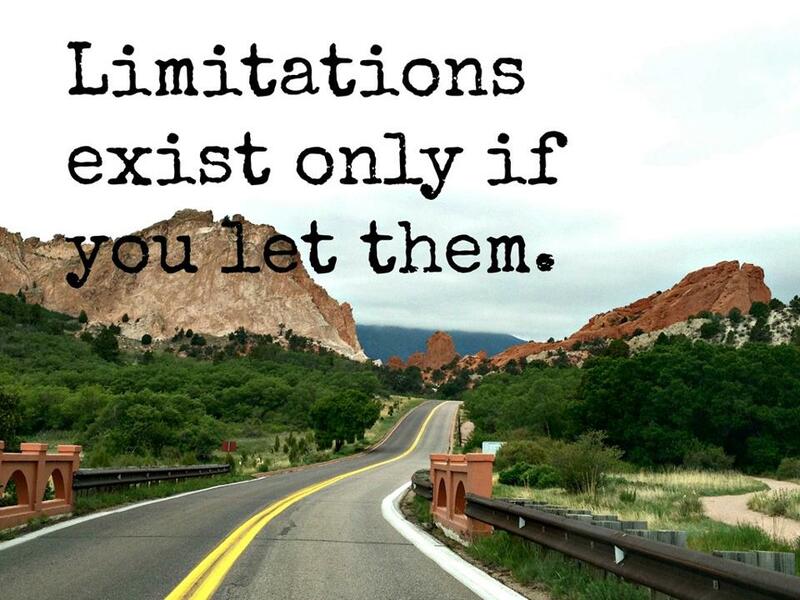 Today was not about pushing beyond my limits, today was about covering some miles with a little quality - I did that! One of the highlights of the day was getting to see, and run for a few minutes with Lonny. It's been a few years since I've seen him. We correspond from time to time with run chat, so it was nice to communicate in person. the only problem - by this time - I was already feeling the effects of the humidity. Lonny "took off" after our brief chat, and with 8 miles done, I decided that 8 miles @ 8:28 avg. was enough for this day. I made the decision to "shut it down" and jog in. It still wasn't easy at the slower pace. I finished the day at 1:56:13. Finished 8th of 103 in my division. (8:48 avg pace on garmin). I left Mandeville with a sore body. with the exception of my quads, my body felt more "inflamed" after this fast training run (my typical training run would be 9:00-9:30 avg) than after TOU. the difference - HUMIDITY ! It just hurts my body! 24 weeks - you must be asking, is she insane? some who know me personally will quickly answer with a "YES, yes she is insane ." next week, we will be 24 wks away from Boston 2013. will I be doing a 24 wk marathon plan? NO ! I would never make it. My fall/winter plan does involve a high number of races. I will evaluate as I go along. 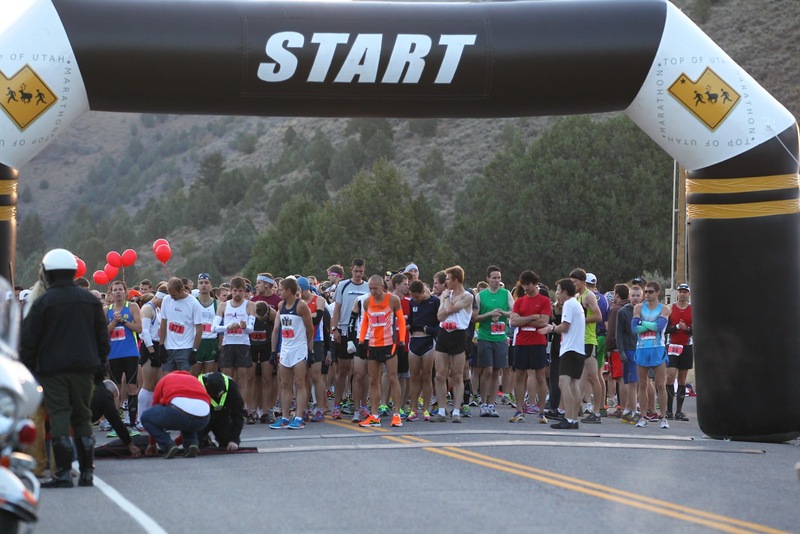 Some will be "races", some will be "training runs", some will be "tempo runs", some may be "fast finish long runs". with the recent warm and humid race, I can tell you this..... I will be racing based on the weather. 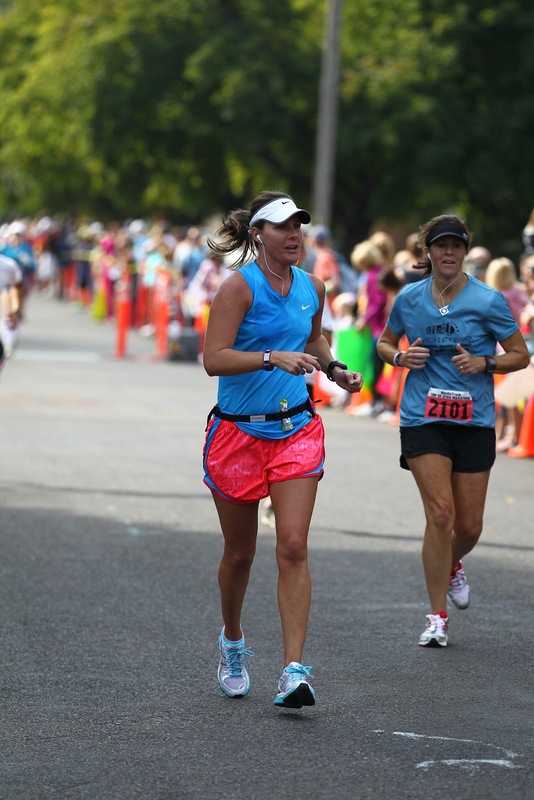 Nov 24th Stennis half marathon - again - only if the weather is "on my side". would like to "race" this one, if I feel I'm ready, and if the weather is "ginny right"
Dec 29th - Steam Whistle 12k - just because it's tradition - may be a tempo, may be a race. Jan 5th - Blue Half Marathon -Jackson, MS this is not the official beginning of my Boston training, but this race will serve as a "hilly half" which I need. I need to race more often on hills. I typically "race" flat and fast - chasing PRs, so I have little experience on racing hills. Jan 20th - LA (baton rouge) half marathon - signed up long ago - will go as training run. Jan 26th - Oh What A Beautiful Day to Run - 5 mile - I may help Terri with this race, or I may race it or tempo run it, depending on my schedule this week. The end of Jan. will be my official start to Boston Training !!!!! Feb 17th - Mercedes Half Marathon - Birmingham, ALthis is another half on the schedule to get some hill training. The fun thing about this one - some friends have decided to get together and ride the train to Birmingham, stay overnight, run the race, hop on the train home. just be a super weekend with friends......toot , toot ! March 23rd - Azalea Train Run 10K - walk, run, fast or slow - I plan to be at this race. - this is just a basic outline of what I may, or MAY NOT do. I will NOT be "racing" at most of these, but would like to do some half marathon racing this fall/winter. Looking forward to some "good weather" racing this fall/ winter. as promised, I have some final thoughts about my 4.5 months of training and race day at Top of Utah, Logan. In addition, the race day pics arrived. I rarely purchase the photos because normally I'm not a fan of my pics, but this time was different. 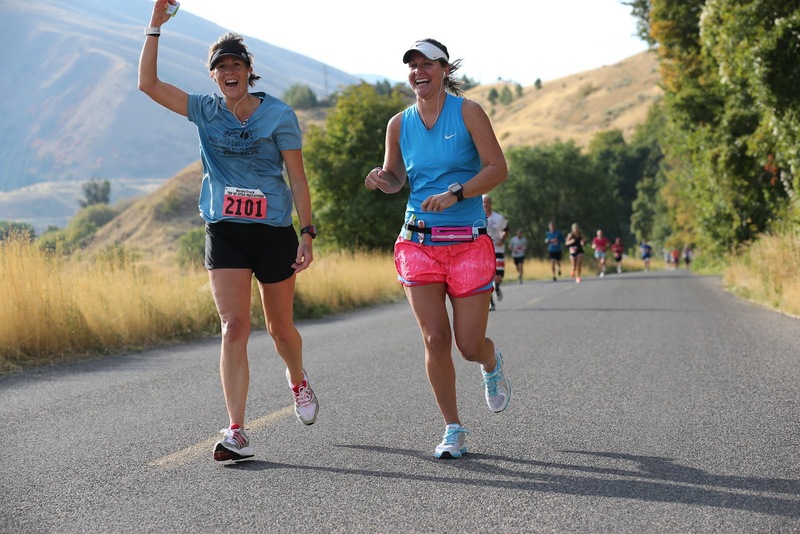 This time, the photos perfectly document the day of running down the canyon to Logan. They capture the spirit, the intrigue, the mystery of the marathon. They capture a magical, fun day. 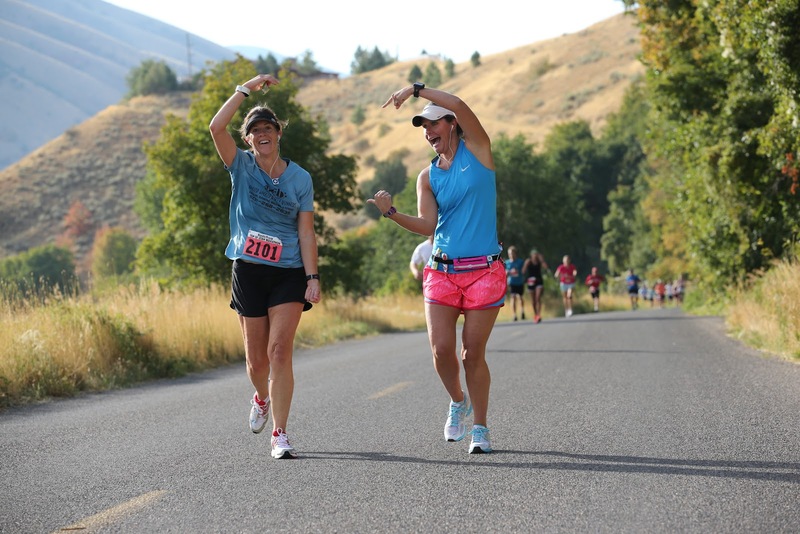 They capture love of running 26.2. They capture friendship and support. They capture the inevitable pain that WILL always come in the final miles. *my mental prep was better/stronger than EVER - I'm finally figuring this marathon thing out - this is exactly why I'm still in the game at number 24, and heading to Boston for marathon number 25. *1st time to purchase a training plan. I purchased a 12 wk McMillan plan - I've typically been of the opinion that a custom plan was not needed, but I believe this, "for me", focused plan, & "phase" plan was beneficial. I filled out extensive details about ME. *having a motivated, no whining, "like-minded" training partner - this helped to make the training fun, and much easier than doing the tough workouts solo. *YOGA - always yoga - if you know me, you know I totally, 100% believe in yoga. I'm lucky to have a GREAT yoga teacher. 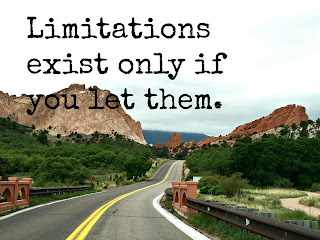 the lesson - NEVER, EVER put limits on your abilities to achieve what seems like crazy goals. **I was so excited about the marathon that day that I totally forgot to eat my "apple-a-day"
You may, or may not recall, my 2012 resolution was to eat an "apple-a-day 2012". Ooooppps! on Sunday, I had 2 apples, so that I will still end 2012 eating 365 apples - so it's all good! 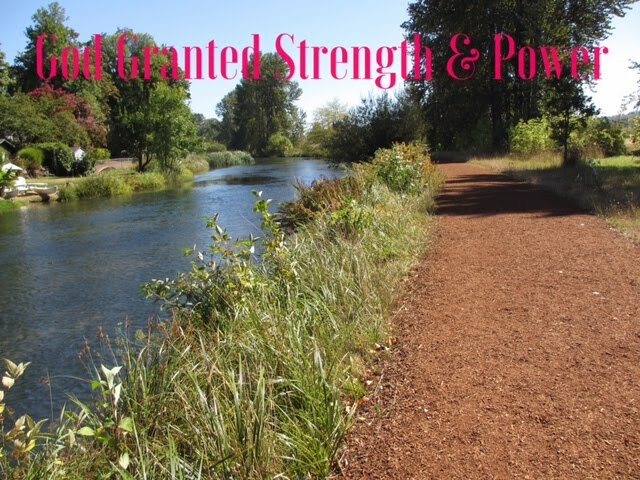 Song of the Day - Mandisa "Stronger"
mile by mile, we RUN TO FINISH IT! "I don't think I can go ANY faster than that! well, maybe I can, but I don't think I have the gumption to try." with this statement, at the time, I was sincere and serious. "3:43 - I ran 26.4 (that extra .2 cost me almost 2 min), I think I can go sub 3:40, like 3:39:50. maybe I will give it a try!" Before we left Utah to return home, I had my goals for 2013 outlined. They will be FUN ! Bring it 2013, I'm READY ! I'm excited to be back at it. I will run a few weeks of easy mileage, and then back to the "real fun stuff"
I will share my 2013 goals in a future post. Sat. 3:40 AM, I wake up, just before the 3:45 alarm clock. coffee, yogurt, raisin bread, and 1/2 banana, shower, get race ready and out the door just before 5:00 to catch the bus to the start. Everything is going as planned. I feel totally relaxed as I ride the bus. We had a 10 min ride, change buses, and then a 30-40 min. ride up the canyon. When we made the turn at mile 14, to go to the top of the canyon, the wind is blowing HARD! ......wasn't expecting that! the day before was totally calm. I quickly calm my nerves by telling myself , "I'm ready , the wind doesn't matter." I represent Strength and Mental Toughness! When we arrived at the top, the winds are calm and the weather is perfectly chilly for running. (potty line, wait, potty line, go to start, shed the extra clothes, and ready to race) The race oddly starts almost 15 minutes late. 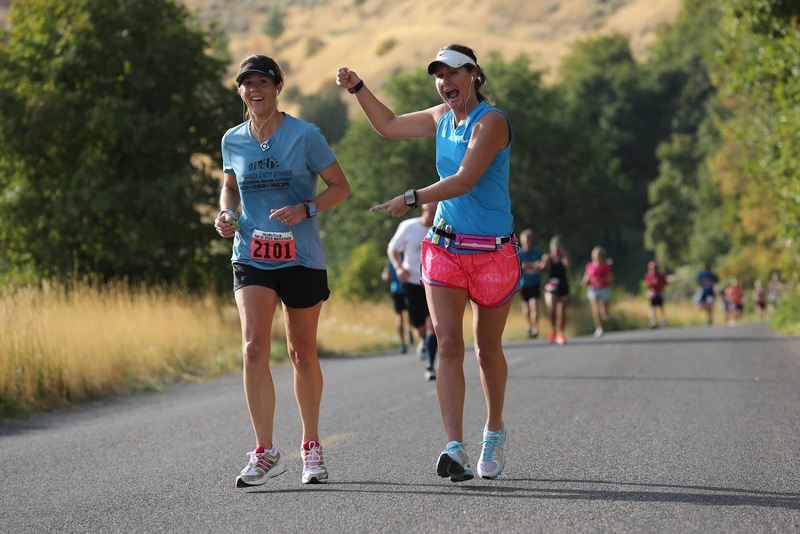 (1st marathon out of 24 to start late) Normally that would be no big deal, but at this race, Terri is meeting me at mile 14 to run with me - eeekkkk. 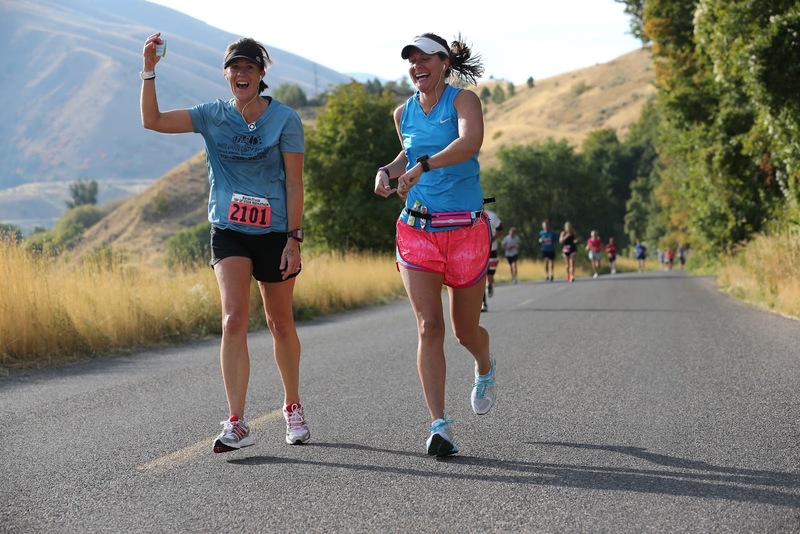 into account elevation gain and loss for each mile, and will help TOU runners maintain an even effort over the varied terrain of the TOU course, and give guidelines to avoiding tactical pacing errors and to conserving glycogen." My goal for the race was 3:44:59. This is my BQ time, at my younger age bracket (40-44) which has remained as my recent goal. (for Boston purposes my age group is 45) The pace chart offered 3:45 so I used that, and planned to run 4 seconds faster for each mile. As we head down the canyon, everything is perfect. I haven't forgotten anything, (garmin, pace chart, ipod, gloves, race shoes, etc - check) and the weather is great. low humidity running - Gotta Love It ! I intentionally start the first mile slower than the prescribed plan, and then plan to get on pace starting with mile 2. 13.1 - right around 1:50:05 ??? At mile 13, the crazy wind that we noticed on the bus was back, but get this - IT WAS AT OUR BACK! Today is my day because I'm running downhill, and the wind is at my back. SWEET! At mile 14, Terri and Chad are waiting. Terri is ready to run, Chad is taking pics. I tell them about the race starting 15 minutes late, which they had already figured out by the pacing balloons. We make the turn at mile 14, and head into the flat area of the course. The wind quickly dies down. I get a "Terri bounce" and the next few miles are fast - 8:08, 8:04, at some point Terri asks me about the pace. She wanted to make sure I was aware of the fast pace. 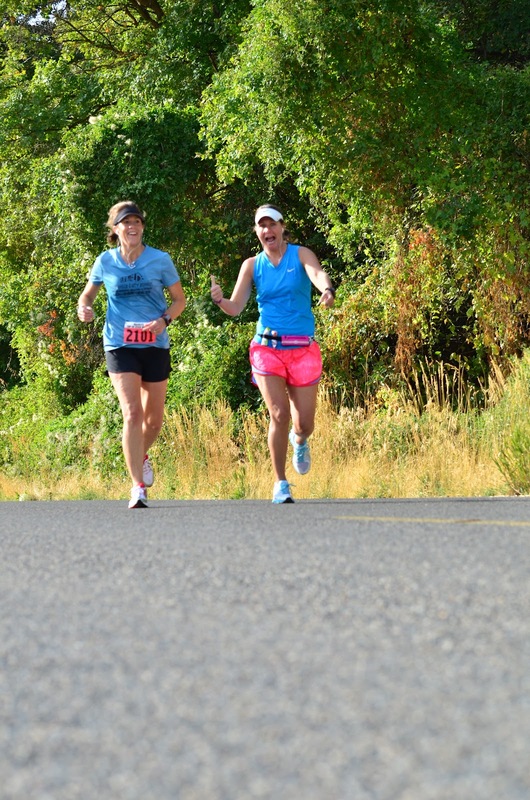 I tell her that my plan was to wait until mile 16 and then make a move, but I was feeling great, so I was "going with it". I tell her it's a gamble, but I'm willing to take the it. 8:02, 8:07, 8:20. I stay well under the weighted pace chart until mile 23. I finish the race at 3:43:28. Terri has been the BEST training partner this summer. She's FUN, energetic, motivated, trains hard, and has BIG goals like me, and we are working hard to achieve them. We support each other, and I was thrilled that she was there to share this day with me, and helping me. I was so honored that she traveled from MS to help me finish strong. She gave me the best encouraging and motivating comments along the way. We Celebrate! Thank you Chad for supporting me. This pic perfectly illustrates a MAGICAL weekend. Chad and I arrived in Logan Thurs. evening. I was thrilled to be greeted with dry air at the Salt Lake City airport. We made a quick stop at the Red Iguana, and then headed to Logan. Your Boston Marathon entry has been received! This is to notify you that your entry into the 117th Boston Marathon on Monday, April 15, 2013 has been accepted, provided that the information you submitted is accurate. I quickly notified Soccer Locker and City Runners that I been confirmed. They immediately began the process of booking a hotel room, and flights for Boston 2013. I'm so honored and thankful for this opportunity. So, I will indeed be in Boston April 2013 for my 2nd attempt to conquer this course. Friday afternoon my friends, Terri (& training partner), and Kristie made the trip from Pocatella, ID (visiting family) to Logan, and we toured the marathon course again. Terri was meeting me at mile 14, and Kristie was helping with logistics (such sweet friends). The course is mostly a gradual downhill course until mile 14. At mile 14, the course is flat for a while and then you have some small uphill sections. The ups are not steep, but the timing of the gradual ups definitely get your attention at mile 18-19.5 and then again around 22-23ish. In the car, the excitement was building. Although, I knew the ups, at the end would not be fun, I was happy that they were not steep. I was anxious to race. I AM READY to RACE! These are the thoughts I would use before and during the race. Many of these are from the book Running Within by Jerry Lynch and Warren Scott. (I highly recommend it). * Every step is another battle won * "none of this is gonna kill ya, so what do you really have to worry about? * Finish Strong! * "I can do all things through HIM who gives me STRENGTH." * The Time is Now! * Yeah! Don't worry! Be happy! * I think I can, I think I can, I know I can, I know I can! "Run like the champ you are !!!" Friday evening I'm in the hotel by 7:15ish, lights out at 9:00 pm ish with the alarm set for 3:45.